Scoop this special holiday stocking-stuffer for the adventure-traveler near you! When asking locals what their favorite thing to do in Detroit is, spending Saturday's in the market is a very likely response. 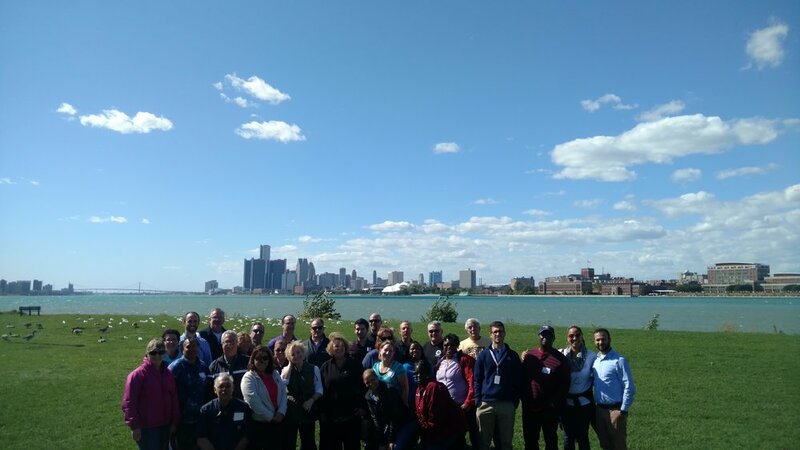 Just a mile northeast of downtown, Detroit's Eastern Market is the cultural hub of Detroit's wholesale food industry and is the largest historic public market district in the United States. Although it has a reputation for being the place to be on Saturday, the market is actually alive with activity everyday of the week. The farmers markets under the historic sheds of Eastern Market remain the heart of this district. The access to fresh produce available here is something cherished by both regular patrons and neighborhood restauranteurs alike. In recent years, the farmers market expanded its operations during the summer months to include Tuesdays in addition to Saturday. Sundays have also become an opportunity for small businesses and artisans to set up shop during Eastern Market's 'Sunday Street Market'. Detroit's Eastern Market district also home to some great restaurants and retailers. Supino Pizza, open since 2008 has become a staple in the market and is regarded as having close to, if not the best pizza in Southeast Michigan. Other Eastern Market favorites include Cutter's Bar and Grill, a great spot to grab a drink or burger in the city, and Russell Street Deli for delicious house made soups and sandwiches . If you're in the mood to create your own culinary masterpiece, the market has no shortage of butcher shops serving fresh meats. Retailers have also decided to make the market home in recent years. In 2015, native Detroiter Tommey Walker opened up a flagship location for his store and clothing brand, Detroit VS Everybody. 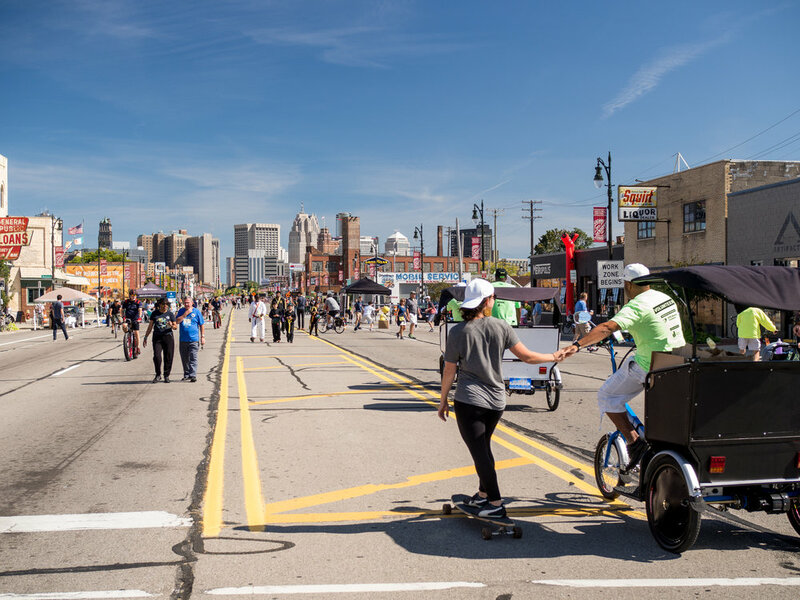 And while we may be the Motor City, non motorized options have become more popular in recent years, especially as residents begin to move closer to the neighborhoods surrounding the market. Enter Motoroless City Bicycle Company. The company opened it's doors in 2015, selling bicycles and accessories as well as offering repair services. The Detroit Mercantile Co is also a popular spot and great place for both new and vintage items. Ready to see this neighborhood upclose? Make a special effort to support Detroit's Eastern Market on Small Business Saturday, November 26th, as we gear up for #ShopDetroitWeek! Register for our free walking tour here. Downtown Detroit is in the midst of a tremendous resurgence. Take a walk down Woodward Ave and the signs of new life are obvious: where we once saw emptiness and decay we find new residential and commercial projects. For the first time time in decades, construction cranes have become a common sight. With all of the new life injected into the Downtown area it was only a matter of time before retailers began to make their way back. Detroit's famed Woodward Ave is where many of these new retailers now call home. Metro-Detroit based Moosejaw was one of the first to get the party started. In 2012 the outdoor recreational apparel store opened what was supposed to be a temporary pop up shop. That store remains open today and was joined by a second storefront in 2015. High end clothing retailer John Varvatos, named after the famous native Detroiter and designer, opened up on Woodward in 2015. Since then it's been joined by other retail heavy hitters such as Kit and Ace and most recently Nike. Those stores will be joined in 2017 by an Under Armor factory store as well as Warby Parker, makers of fashionable and affordable glasses. The Z Garage, a Bedrock Real Estate project was also a catalyst for new retail Downtown. The Z is home to the first Detroit location for Michigan based 'Vault of Midnight', a favorite of comic book lovers, as well as NoJo Kicks. NoJo has become a mecca for local sneakerheads, stocking what's new as well as sought after classics. Foodies have your appetites and camera phones ready, as Downtown has no shortage of great places to eat. Local favorites include Hudson Cafe for breakfast, and highly acclaimed restaurants Roast, Townhouse, and Vicente's Cuban Cuisine to name a few. Ready to see this neighborhood upclose? Experience what Downtown has to offer firsthand with a free walking tour on Friday, December 2nd from 5:30pm-7:30pm. RSVP here. Just east of Downtown Detroit you'll discover an area known as 'The Villages'. This area, walking distance from Belle Isle, is made up of 6 neighborhoods: Berry Subdivision, East Village, Gold Coast, Indian Village, Islandview Village and West Village. These collections of neighborhoods are known primarily for their beautiful homes, however more recently they've become a favorite for entrepreneurs to set up shop in. It's here where you'll find Detroit favorites like Detroit Vegan Soul and Sister Pie, both BUILD Institute alumni as well as Hatch Detroit recipients. Agnes Street near Detroit Vegan Soul is also home to coffee/pastry shop The Red Hook as well as the popular Craft Work restaurant. Just down the street on Van Dyke you'll stumble upon what looks like a home, but is in fact a place for audiophiles to purchase their favorite vinyl from: Paramita Sound. With vinyl records making quite the comeback in recent years, Paramita Sound has become a popular destination for those looking to buy both classics and modern albums in the format that so many cherish. The popularity of these neighborhoods for food and traditional retailers is without a doubt growing and we're excited to continue to see new businesses set up shop and call the area home. Ready to see this neighborhood upclose? Join DXF for a free walking tour of the Villages neighborhood on Saturday, December 3rd from 11am-1pm. RSVP here. Midtown, the Cass Corridor, there may be differing opinions on what to call this Detroit neighborhood but one thing everyone can agree on is that there is no shortage of things to do. Saying that Midtown has it all is quite appropriate: neighborhoods, educational and cultural institutions, great food and shopping, it's all here. Midtown is home to both Wayne State University and the College for Creative Studies. It's also where you'll find the world renowned Detroit Institute of Arts, Charles H. Wright Museum of African American History, and Michigan Science Center. Planning on heading to Detroit to visit one of these attractions? If so there will be plenty to do both before and after. The neighborhood is home to great Detroit restaurants both old and new. The list includes Selden Standard, which was named 'Detroit restaurant of the year' by the Detroit Free Press in 2015, and Hour Detroit Magazine in 2016. You'll also find Hatch Detroit winners La Feria and Rock City Eatery, along with neighborhood favorites Motor City Brewing Works, Traffic Jam & Snug, Cass Cafe, and the Bronx Bar to name a few. Midtown in recent years has become one of Detroit's best shopping destinations. The list of retailers calling this neighborhood home is long, including Shinola, City Bird, Nest, Hugh, Nora, Source Booksellers and Will Leather Goods. Ready to see this neighborhood upclose? Join us for our free Midtown Shopping Tour, Wednesday November 30th from 5:30-7:30pm. Experience what makes Midtown great with the help of one our experiences Ambassadors, and help support local business while crossing off to-do's on your holiday shopping list. Corktown: The Oldest Neighborhood in a City Rich with History. Corktown, Detroit's oldest neighborhood is as you would expect rich with history. It seems that everyone has their own favorite memory of the area. For many, it's looking back fondly at taking the bus down Michigan Ave to Tigers Stadium and catching a game. For others it might be visiting Michigan Central Station while still in operation and standing in it's grand lobby. Those two memories may not be able to be relived in the present day, but the neighborhood has no shortage of things to do and ways to create new ones. Corktown, named so because the majority of Irish immigrants that inhabited it in the 1800's were from County Cork, features a blend of traditional residential housing as well as restaurants and retailers. The primary retail corridor is located on Michigan Ave. It's there where you'll find some of Detroit's hottest restaurants: (Slows Bar BQ, Gold Cash Gold, and Mercury Burger Bar to name a few), as well as places to grab the drink of your choice (Astro Coffee for your all your caffeinated needs, and places like Two James Spirits and Sugarhouse for beverages of the adult variant). The Tigers may not be in the neighborhood any longer but that doesn't mean Corktown isn't the place to be on gameday. Catch the game at Nemo's, or meet beforehand for a quick bite to eat or drink and take the shuttle over to Comerica Park or the Joe. New developments mean that the old corner on Michigan and Trumbull won't be baseball free much longer. The Detroit Police Athletic League (Detroit PAL), will soon have a new state of the art facility to serve as a safe place for the children of Detroit to learn and play. Ready to see this neighborhood upclose? DXF will be conducting a free walking tour through Corktown on Sunday, November 27th from 2-4pm. Get a headstart on your holiday shopping as while learn more about Detroit's oldest historic neighborhood. In Northwest Detroit along Livernois Ave, you'll discover an area known as the 'Avenue of Fashion'. A stones throw away from historic neighborhoods such as the University District, Green Acres, Sherwood Forest and Palmer woods, this area is a destination for both shopping and good eats. True to its name, the Avenue of Fashion features plenty of clothing retailers such as Flagship Boutique/District 81 Clothing, owned by Detroiter Ty Haygood; SimplyCasual Clothing and Lifted Boutique. The area is also home to some of Detroit's newest food destinations such as Kuzzo's Chicken & Waffles, where former NFL player Ron Bartell offers southern style cuisine in a casual dining atmosphere; and April Anderson’s Good Cakes and Bakes, an organic bakery business modeled as an example of new and innovative growth in the Detroit at the CGI America Conference early last year. 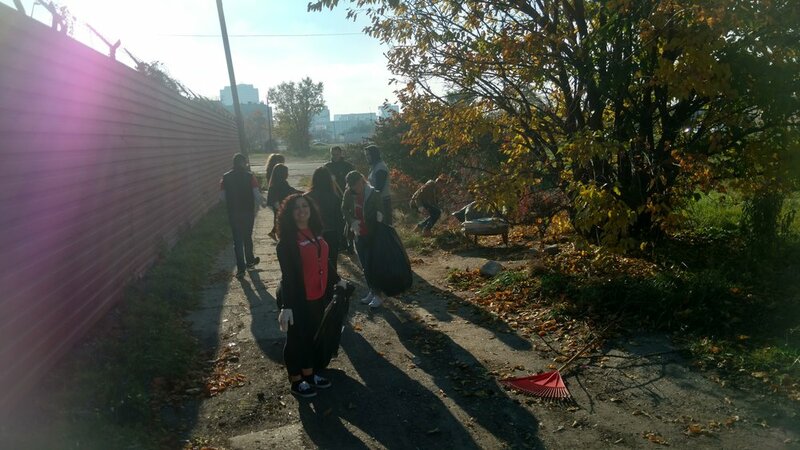 Thanks to organizations like Motor City Match, empty storefronts are filling up with new tenants ready to serve as staples in their community. Motor City Brewing Works is set to open a second location soon on the avenue, and will be joined by newcomer Slyde. DXF will be holding a free walking tour through the neighborhood on Saturday, December 3rd from 2-4pm. This is a great opportunity to learn more about the Avenue of Fashion with the help of one of our DXF Ambassadors, and experience some of what make's this neighborhood so great on Small Business Saturday! 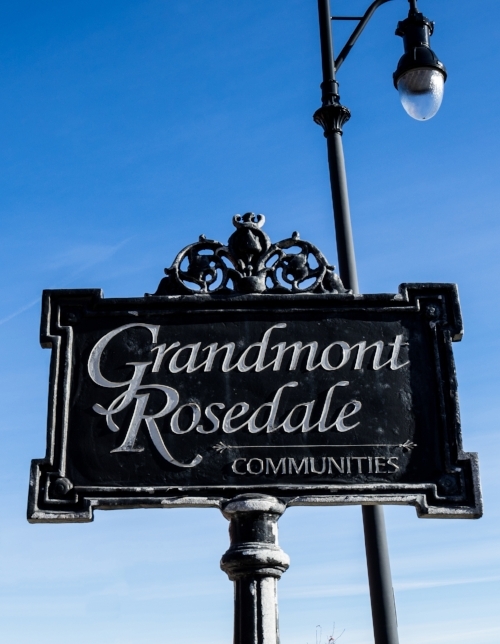 The Grandmont Rosedale community on Detroit’s northwest side is made up of five neighborhoods: Grandmont #1, Grandmont, Minock Park, Rosedale Park, and North Rosedale Park. When we talk about this area we tend to think of the beautiful homes in the neighborhoods, of which there are plenty. Spending an afternoon there, it's easy to see what organizations like the Grandmont Rosedale Development Corporation (GRDC), are pushing hard to make known: the area is becoming a destination for good food and shopping as well. The primary retail corridor in the Grandmont Rosedale area is situated on Grand River Ave. between the Southfield freeway and Evergreen Rd. It’s there where you’ll find businesses like Pages Book Shop, Elias Donuts, and soon a second location for Detroit Vegan Soul. While the neighborhood already has a lot going for it, one of the more encouraging things to hear was that it was recently awarded $150,000 by Hatch Detroit to add landscaping, bike racks, and improve signage for some of the businesses in the corridor. On Saturday November 26th, the GRDC will be encouraging all to 'Shop small in GRANDmont Rosedale'. In addition to the existing businesses in the area, there will be pop-up shops and food trucks throughout. Families can also design and create their own Christmas wreaths, and have their purchases gift wrapped at the GRDC offices. DXF will be conducting a free walking tour of the neighborhood during the event from 11am-1pm. This is your chance to experience Grandmont Rosedale like never before with one of our experienced Ambassadors. Join us for this free holiday event and help support local businesses on Small Business Saturday! The Grand River corridor from high above with the Downtown skyline visible in the distance. The Grandmont Rosedale neighborhood has no shortage of beautiful homes. To say downtown Detroit is buzzing right now would be an understatement. Downtown Detroit is absolutely booming with new restaurants, bars and retail stores opening up every day and the GMRENCEN is right in the center of it all. 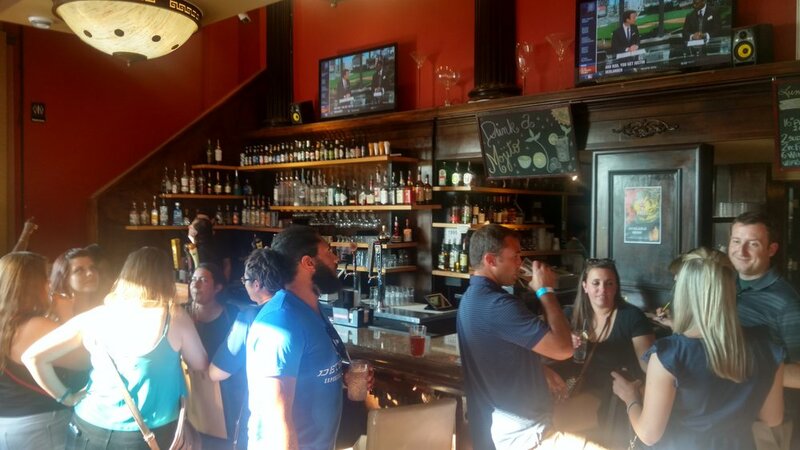 Over the last few years, downtown Detroit has become a hot spot for after work events like happy hours and social gatherings. The GMRENCEN is more than just an office space, you can kick back and relax after a hard day’s work here too! Here are some things you can do after 5 p.m. (and on weekends) in the GMRENCEN! Coach Insignia is perched right at the top of the GMRENCEN on the 72nd floor. After 4 p.m. the restaurant opens for happy hour and dinner so you can catch the elevator all the way up to the top of the building and grab a drink and apps or stay for dinner with an amazing view of two countries. This is definitely one of the most unique happy hour spots in the city, which goes from 4 p.m. to 7 p.m. 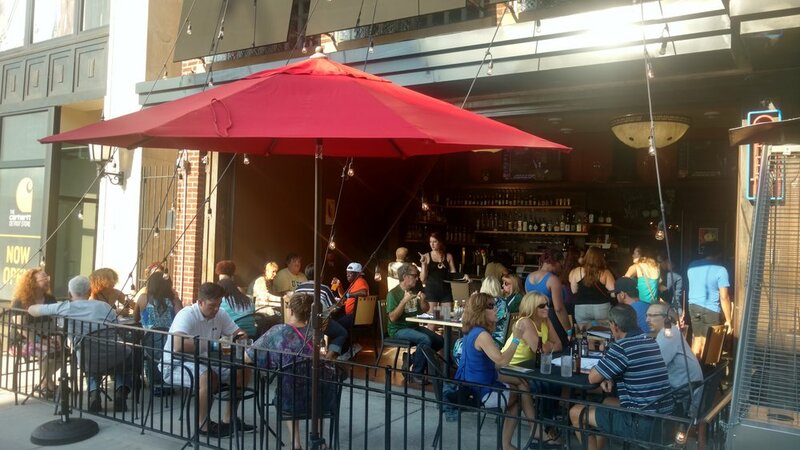 Granite City is one of Detroit’s newest hot spots with a recently opened patio on Jefferson Ave. which is a prime location for people watching. Granite City’s happy hour goes from 3 p.m. to 6 p.m. and has tons of great specials including a variety of drink and food options. In the bar area of Joe Muer, you can order from a happy hour menu which includes sushi, sliders, and other bites along with select cocktails, wine and beer (some of which are half off!). The happy hour at Joe Muer starts at 4 p.m. Monday through Friday and ends at 6 p.m.
Near the lobby of the Marriott is Volt, a contemporary bar that features all kinds of food and drink specials during happy hour which is from 3 p.m. to 7 p.m., Monday through Friday. Volt’s happy hour menu includes light food like hummus and warm pretzels along with a wide variety of drink specials including $5 draft beer, $4 house wine and $5 house liquor. Andiamo has a $5-$6-$7 happy hour special Monday through Friday from 3 p.m. to 6 p.m. The happy hour special includes twists on classics like Portobello mushroom fries and Italian nachos. The special also features half off cocktails, beer and wine. Where is your favorite after 5 spot in the GMRENCEN? Let us know in the comments section. The DXF Challenge is our way to inspire Detroiters to spend the summer experiencing the food and drinks at some of the 622 bars, restaurants & cafes on our DXF’s checklists through Instagram! Every time a challenger visits a bar or restaurant, they tag @WeKnowDetroit with a picture of them enjoying something delicious, using the hashtag #DXFChallenge. And you can too! Here’s our #DXFChallenge weekly recap, featuring some of the latest stops & best moments from this week’s top 10 #DXFChallengers! In addition to fresh cup of joe, Dessert Oasis Coffee Roasters also serves up a variety of sweet treats, from cheesecake to crepes. A fresh serving of California-style Mexican Cuisine inside downtown’s Calexico Detroit. I got my order 2 go...I ordered the cowboy...the monster burger & the cheese bread with the chicken and Frank's red hot...omg it is sooo good! @WeKnowDetroit #DXFchallenge Had a Jager bomb while I was there but I had 2 stop taking pictures because my phone died. Will stop in after tigers games,now great place! The Lamb Kafta at Byblos Cafe & Grill looks amazing! Sunday Brunch at Louie's Ham & Corned Beef in Eastern Market. Kicking off a Southwest taco crawl at El Veloz Taco. Pinky's raised here at The Whisky Parlor. Nothing like Sugar House cocktails to set the scene. 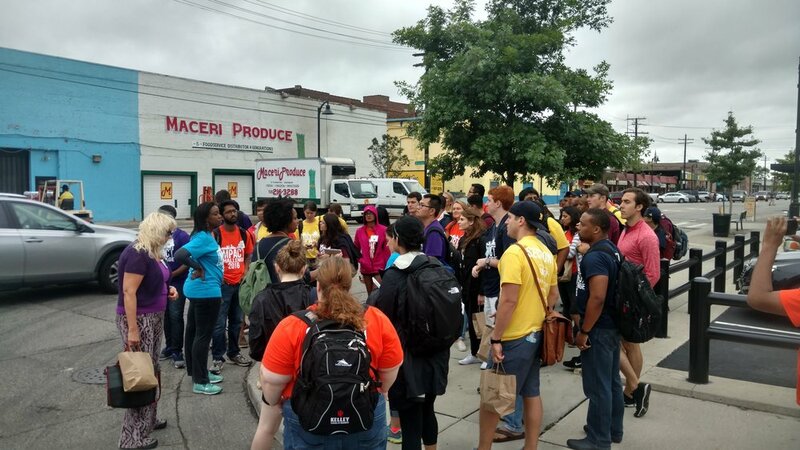 This bookclub stopped for fresh, vegetarian cuisine at Seva Detroit. This monstrous ‘Quadruple Patty Burger’ at Great Lakes Burger Bar. Had Chubby Duck Sushi yet? These Rattlesnake Club lamb chops look delicious! Try the Vegan Blueberry over at Dilla’s Delights. Got bees? Bring cucumbers. Taco night at Mudgie's. This brew-lovers enthusiasm is infectious! A quick caffeine fix at Roasting Plant. Gluten-free goodness at Go! Smoothies.